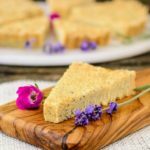 A recipe for Lavender Poppy Seed Shortbread. Dried lavender flowers and poppy seeds give both floral and earthy flavors to buttery shortbread. Lightly grease a 10-inch tart pan with a removable bottom. Grind the lavender, 1 tablespoon turbinado sugar, and lemon zest in a spice or coffee grinder until it is a finely ground (like a powder). Beat the butter, lavender powder, granulated sugar, and lemon juice in a large bowl until light and fluffy. Whisk together flour, poppy seeds, and salt in a medium bowl. Add to creamed mixture. Beat on low speed until just combined. Mixture will be crumbly. Spread mixture evenly into prepared pan. Cover with plastic wrap and press down very firmly with your hands. Smooth out as much as possible. Chill the dough in the pan covered with plastic wrap for 20 to 30 minutes. Remove and discard plastic wrap. Use a heat-proof 2 1/4-inch round cookie cutter to cut a round from the center. Discard dough round and put cutter back in the center. Use a wooden skewer to prick holes in 1/4-inch increments all over the dough. Lightly brush the top with milk or cream. Sprinkle with turbinado sugar. Bake for 1 hour, or until golden brown and firm in the center. Immediately after removing shortbread from the oven, use a paring knife to slice into 12 wedges. Do not wait to slice after they have cooled. Let shortbread cool completely in the pan on a wire rack. Remove shortbread from the pan. You may need to cut again to break apart the wedges.